. Published on January 4, 2013 . 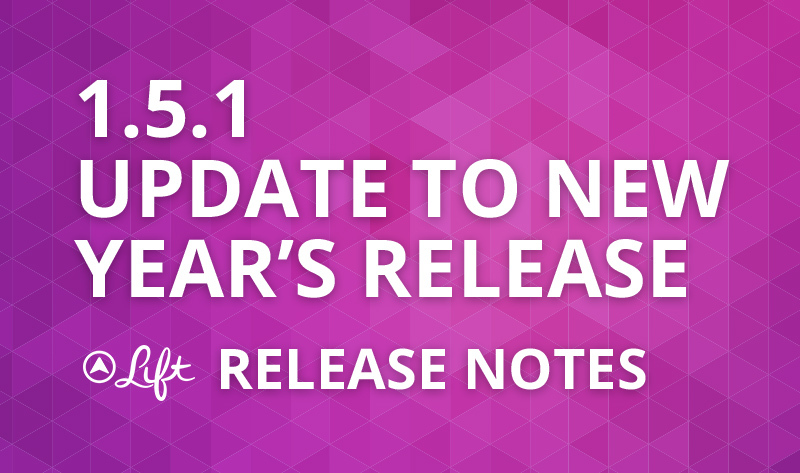 Earlier this week we put out a big release to support New Year’s Resolutions. It was definitely the biggest release we’ve done since we’ve launched. Today’s release is a set of incremental improvements on what we just did. * Sped up check-ins by 40%. * Switched over to Apple’s native Facebook auth. * Added swipe-to-remove for habits. * Fix a bug that was preventing two people from sharing the same device. If you’re trying to decide whether it’s worth updating Lift, then the answer is: Yes, for the speed improvement. Read on for some background information the how and why behind this release. Writing about new features is easier than writing about incremental updates, although usually the updates are more important. Nobody knows if new features are really going to matter. But our updates are always prioritized to hit the features that are mattering the most. For example, people check in to habits at a rate that’s six times greater than they give props and sixty times greater than they leave comments. It’s far and away the most commonly peformed action on Lift. So obviously, this is a high impact area to improve. We’ve opted for a product development approach that’s very incremental. It’s actually almost identical to the approach you take on your habits. We try to make a little bit of progress each day. In software circles this is called continuous delivery and is tied to the greater Lean Startup movement. We’re releasing new versions of the iPhone app as fast as Apple will allow us (which has recently been 8-10 business days). Additionally, we built Lift to give us some flexibility to deploy features server-side and we’ve been releasing these as often as daily or hourly. For example, we released four server side features in the five days before New Year’s: general reminders, per-habit reminders, friends, and a Resolutions category of habits. The reason I share this, is that I wanted to give you an example of how committed we are to the concept of consistency because that’s basically the virtue that you’ve signed up for with Lift. If you can build yourself out of the right consistent routines then you will be able to achieve anything. That’s what habits are. That’s what Lift is helping you do. I’ve seen several people on Twitter describe Lift as implementing the Seinfeld productivity method, which is quite a complement because he’s one of the most successful and productive comedians of all time. The method people are referencing is his “don’t-break-the-chain” approach to writing jokes: he tries to write at least one every day and he tracks that with a big X on his calendar. Here we have a very successful professional who’s foundational secret of success is consistency. I hope that gives you some motivation to keep your New Year’s Resolutions going.